You are currently browsing the archive for the TurboGrafx/PcEngine category. As best I can tell, this game is another game based around the ancient novel Nanso Satomi Hakkenden. The plot is similar to the 1982 novel Shin Satomi Hakkenden with a reworked plot based off of the orginal. 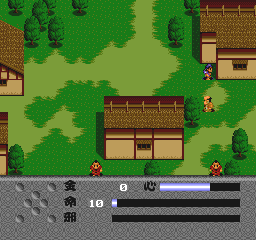 The game is a PCEngine HuCard game published by Data East, and came out in 1989. This is the first town in the game. The hero is in the upper right, facing the wall.